Background: The aim of the present meta-analysis is to determine the efficacy of tetracycline group of antibiotics as local drug delivery agents in the treatment of chronic periodontitis. Materials and Methods: MEDLINE, EBSCO, Cochrane database, and Google Scholar were used to identify studies in English published up to January 31, 2017. An additional hand search of relevant journals and of the bibliographies of the paper identified was also performed. Articles retrieved were screened using specific inclusion criteria by two independent reviewers. Randomized control trials investigating the effect of tetracycline group of antibiotics as local drug delivery agents in chronic periodontitis were included in the study. 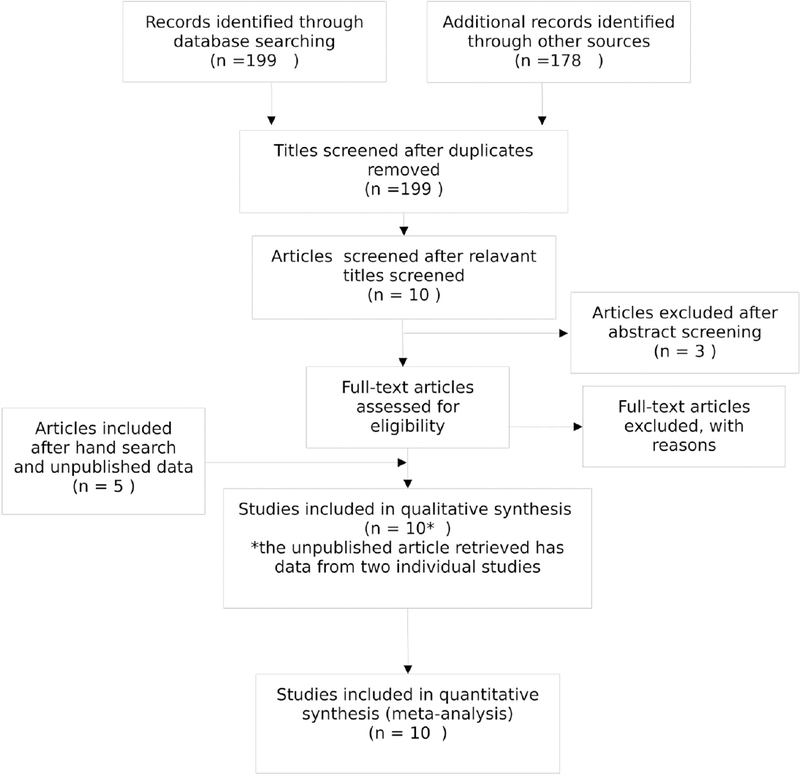 Results: Ten relevant articles were selected for the meta-analysis, of which five articles were retrieved after electronic search, three articles were included after hand search, and two unpublished articles were included. The number of patients in studies ranged from 13 to 140 sites with mean age ranging from 20 to 75. 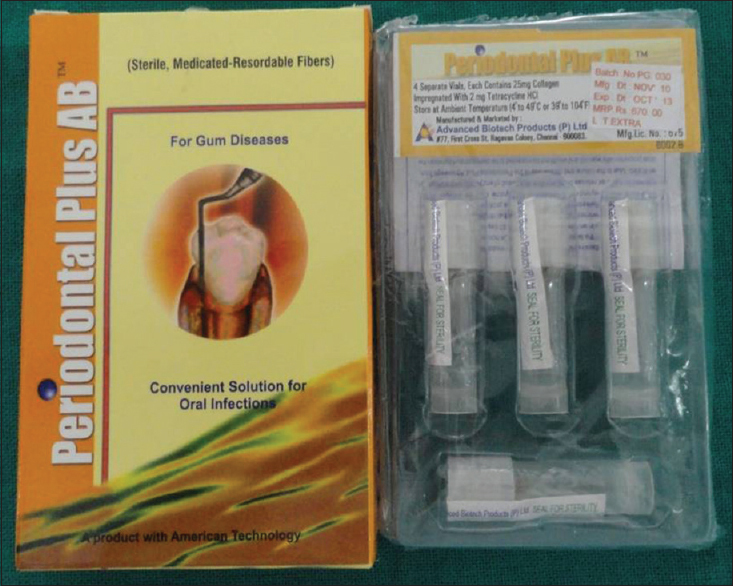 A total of 588 sites were treated using tetracycline group of antibiotics as local drug delivery agents in the treatment of chronic periodontitis. The meta-analysis showed standard difference in mean −1.02 mm (95% confidence interval [CI] 0.28, 1.75) for clinical gain in attachment in favor of tetracycline group. Standard difference in mean for probing depth (PD) was 1.20 mm (95% CI 0.57, 1.87) in tetracycline group. Conclusion: The results of this meta-analysis showed a significant improvement in periodontal parameters such as CAL, PD, and sulcular bleeding index in favor of tetracycline as local drug delivery compared to placebo. Background: Chlorhexidine (CHX) is the gold standard of all chemical plaque control agents and the most commonly prescribed mouthwash. However, several studies have shown cytotoxic and genotoxic effects of CHX on various eukaryotic cells. In this study, we have used micronuclei as a biomarker of DNA damage in buccal epithelial cells of chronic gingivitis patients who were given adjunct 0.2% CHX for plaque control. Materials and Methods: Chronic gingivitis patients who were exclusively on mechanical plaque control methods were taken as control (Group A) (n = 101), and chronic gingivitis patients who along with mechanical plaque control measures were taking 0.2% chlorhexidine mouthwash as adjunct were taken as cases (Group B) (n = 255). The Group B was further divided into 5 subgroups (B1, B2, B3, B4, B5) (n = 51) on increasing duration of usage of CHX from ≤1 week to 24 weeks. Buccal epithelial cells were gently scrapped from the buccal mucosa using soft toothbrush. The epithelial cells were collected in buffer solution and centrifuged at 8000 rpm for 5 min. 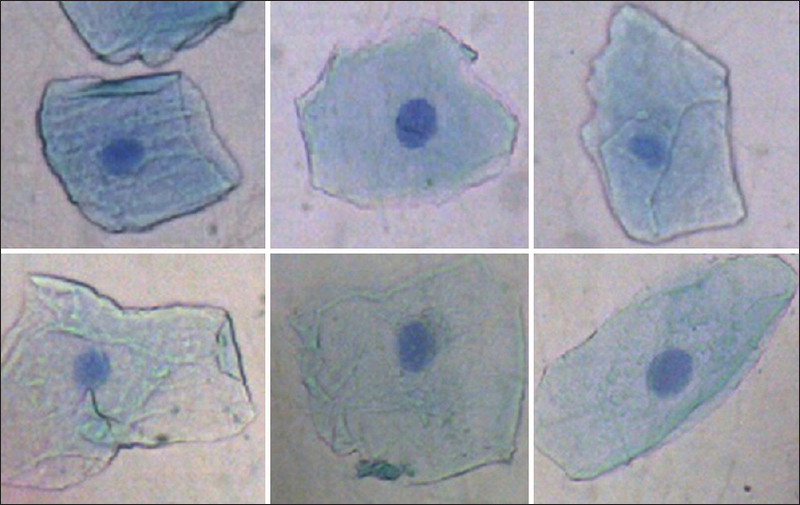 The buccal epithelial cells were air dried, fixed, and stained with 5% Giemsa stain on preheated glass microscopic slides and observed under microscope to screen 2000 nucleated cells per individual for number of micronucleated cells and micronuclei as genotoxic measure. 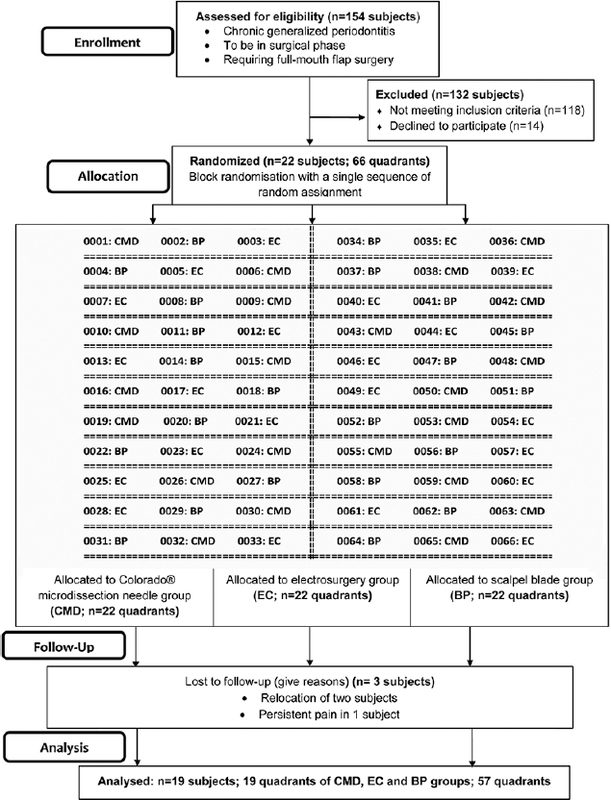 Results: The mean number of micronucleated cells was found to be 0.41 ± 0.71 for Group A as compared values ranging from 1.65 ± 2.09 (Group B1) to 11.7 ± 1.87 (Group B5) in different subgroups of Group B, and similarly, the mean number of micronuclei was found to be 0.48 ± 0.80 for Group A as compared to values ranging from 2.57 ± 1.64 (Group B1) to 14.5 ± 2.49 (Group B5) in different subgroups of Group B using analysis of variance (P < 0.001). Conclusion: We conclude that CHX mouthwash is genotoxic to buccal epithelial cells and there is incremental trend in genotoxicity as the duration of usage is increased. Background and Objective: Nitric oxide (NO) is a widespread signaling molecule which is known to influence varied biological processes. However, an uncontrolled high level of NO accelerates tissue destruction. 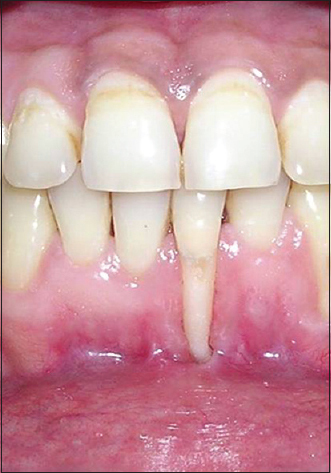 The pathogenesis of periodontal disease is also affected by smoking which alters the inflammatory response. The present study was thus performed to assess the effect of nonsurgical periodontal treatment on salivary and serum NO levels in smokers and nonsmokers with chronic periodontitis. Materials and Methods: Forty patients with chronic periodontitis, including 20 nonsmokers and equal number of smokers participated in the present study. Probing depth, clinical attachment level, plaque index, gingival index were assessed, serum and saliva samples were obtained from the patients at baseline and after Phase I therapy at 6 weeks to estimate NO by Griess colorimetric reaction. Results: Smokers showed higher serum and saliva NO levels 30.3 ± 3.28 and 50.4 ± 4.07 μM as compared to nonsmokers 20.05 ± 2.42 μM and 37.5 ± 2.95 μM, respectively, at baseline. After Phase I therapy, both the groups exhibited significant improvement in clinical parameters and reduction in serum and saliva NO levels; however, reduction was higher in nonsmokers. Conclusion: More destructive expression of periodontal disease in smokers causes an increase in the concentrations of NO and less reduction after Phase I therapy as compared to nonsmokers with chronic periodontitis. Hence, NO levels in saliva and serum could be used as indicators of periodontal inflammatory condition. Context: Local administration of antimicrobial agents offer a “site-specific” approach to the periodontal therapy and it has several benefits. Aim: The present study was aimed to assess the clinical and microbial changes by subgingival irrigation using different subgingival irrigants in periodontitis patients and also to assess the mechanical effect of different local irrigation devices; if any. Settings and Design: Split-mouth design was employed on ten individuals. Materials and Methods: The study sample consisted of 10 individuals in whom full-mouth scaling and root planing was performed and subgingival irrigation therapy was instituted for an experimental period of 30 days. The clinical as well as microbiological parameters were evaluated. Statistical Analysis Used: To calculate baseline data with day thirty data,paired t-test was used. Intergroup comparison was carried out using one-way ANOVA. Multiple comparisons among groups were carried out using post hoc Tamhane's T2 test. Results: Among the different subgingival irrigants used, 0.2% chlorhexidine gluconate is most effective followed by ozonated water, whereas saline was found to be ineffective when compared to the other two subgingival irrigants. Subgingival irrigation using pulsated device may not have any additive effect in alteration of the subgingival microflora. Conclusion: Within the limits and scope of the study, it can be safely concluded that 0.2% chlorhexidine may be used as an adjunct to mechanical therapy for achieving a significant reduction in inflammatory periodontal changes and also reduction in periodontopathogenic microflora. Background: Since bacterial strains developed resistance against commonly used antibiotics and side effects became more serious, other alternatives have been postulated. There is an answer for this issue in ancient medicine. Many plants have been proved to provide antibacterial effect. In this study, Boswellia serrata (BS) and Nigella sativa (NS) were assessed to evaluate the antibacterial effect on Aggregatibacter actinomycetemcomitans (A.a) known as main pathogen of aggressive periodontitis. Materials and Methods: Broth microdilution method was used to obtain minimum inhibitory concentration (MIC) of crude extract of BS and NS. Furthermore, the logarithm of colony forming units grown in fresh brain heart infusion bacterial culture was assessed. Three groups including BS+ (containing only BS), NS+ (containing only NS), and BS-NS− (control group) were defined. For each group, the experiment was repeated 12 times. Results: MIC of BS and NS were 512 μg/mL and 128 μg/mL, respectively. No growth was observed in our negative control group. The mean ± standard deviation of logarithm of CFU/mL for BS, NS, and control group was 4.32 ± 0.36, 3.61 ± 0.3, and 5.57 ± 0.19, respectively. ANOVA test revealed significant difference (P values < 0.0001) of these groups which was later confirmed using the post hoc test of Tukey's honest significant difference (all sP < 0.0001). Conclusions: Both BS and NS are effective against A.a which should be taken into account as appropriate ingredient for oral hygiene products. Background: Tetracycline is one of the primary antibiotics prescribed for antimicrobial therapy in periodontics. It has a broad spectrum of activity being effective against most bacteria as well as spirochetes. Due to limitations of systemic drug therapy, recent formulations of the drug for local administration in the subgingival area have been introduced, including collagen fibers impregnated with tetracycline. Aims and Objective: To compare the effectiveness of tetracycline fibers alone or in combination with scaling and root planing (SRP) on clinical parameters in chronic periodontitis patients. Materials and Methods: A total of twenty patients comprising of both sexes in the age group of 35-60 years with chronic periodontitis were selected. Split-mouth design was used, and three teeth from each patient with periodontal pocket measuring > 5 mm were selected which were treated with different treatment modality. They were randomly divided into site A (SRP), site B (tetracycline fibers only), and site C (combination therapy). Clinical parameters of plaque index (PI), gingival index (GI), pocket probing depth, and clinical attachment level (CAL) were recorded at 0, 30, and 45 days. The data obtained was compiled and put to statistical analysis. Results: All the three groups showed improvement in PI, GI, probing pocket depth, and CAL. Results of the study showed greater improvements in clinical parameters in Group C compared to Group A and Group B. Conclusion: The results indicate that the adjunctive use of tetracycline fibers with SRP is a clinically effective and simple nonsurgical treatment method to improve periodontal health. Context: Electrosurgery offers many unique advantages such as hemostasis and precise tissue cutting; however, there are a number of disadvantages including thermal injury and delayed wound healing. Aims: The aim of the present study was to compare the outcomes of incisions made by Colorado® microdissection needle, electrosurgery tip, and surgical blade during periodontal surgery. Settings and Design: Twenty-two individuals participated in this study. Three quadrants in each individual were randomly assigned into each of the following experimental groups: Colorado® microdissection needle (CMD), electrosurgery tip (EC) and surgical blade (BP), in which, incisions were given with Colorado® microdissection needle, straight electrocautery tip, and a scalpel blade, respectively. 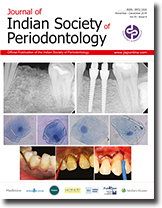 Materials and Methods: Blood loss (BL) was measured immediately after surgery, and changes in interdental papilla dimensions were recorded at baseline, 7, 30, 120, and 180 days after surgery. Measures of periodontal disease were recorded at baseline, 120, and 180 days after surgery. Postoperative pain and wound healing were recorded at 1, 7, and 15 days after surgery. Results: The use of CMD for periodontal surgery showed better results over EC in all parameters. CMD resulted in lesser bleeding and less postoperative pain and attained similar results to that of BP in clinical parameters of periodontal disease. Conclusions: Colorado® microdissection needle may be a better choice for incisions as it seems to show less tissue damage than cautery and offers tissue healing comparable to scalpel blade. Background: The purpose of the study is to examine the quality of life (QoL) in chronic periodontitis (CP) patients associated with or not with well-controlled type 2 diabetes mellitus (DM2). Materials and Methods: Five hundred CP patients, 250 with DM2 (GDM2 group) and 250 age- and gender-matched controls without DM2 (GND), were enrolled in this cross-sectional case-controlled study from January to September 2015. They were interviewed by a QoL questionnaire (Functional Assessment of Chronic Illness Therapy-Fatigue) validated to Portuguese. Periodontal examinations were also performed to confirm CP: probing pocket depth and clinical attachment level must be >3 mm. Results: An association between the presence of DM2 and a high negative impact on QoL was observed. All domains in GDM2 patients presented mean values above 19. On the other hand, three functional domains in GND (physical, social/family, and emotional) showed values below 19 (medium negative impact). Comparisons between GND and GDM2 revealed the statistical difference between them for all domains (P < 0.05). Conclusions: This study shows that DM2 associated with CP negatively affect QoL, even considering well-controlled diabetic patients. Sarcoidosis is a common multisystemic granulomatous disease characterized by the formation of nonnecrotizing epithelioid granulomas in various body organs. The most commonly affected organs in the head-and-neck region include salivary glands and cervical lymph nodes. Involvement of the oral mucosa is very rare. The purpose of this report is to present an atypical oral manifestation of sarcoidosis with ulcerations of the buccal mucosa in a 59-year-old female. Mucous membrane pemphigoid (MMP) is a heterogeneous group of autoimmune chronic inflammatory, subepithelial blistering disorder, predominantly involving the mucous membranes. It has a female predilection and commonly occurring after the fifth decade of life. The oral mucosa is affected in more than 90% of cases. Dentists could be the first health personnel to identify and diagnose this rare mucocutaneous lesion. 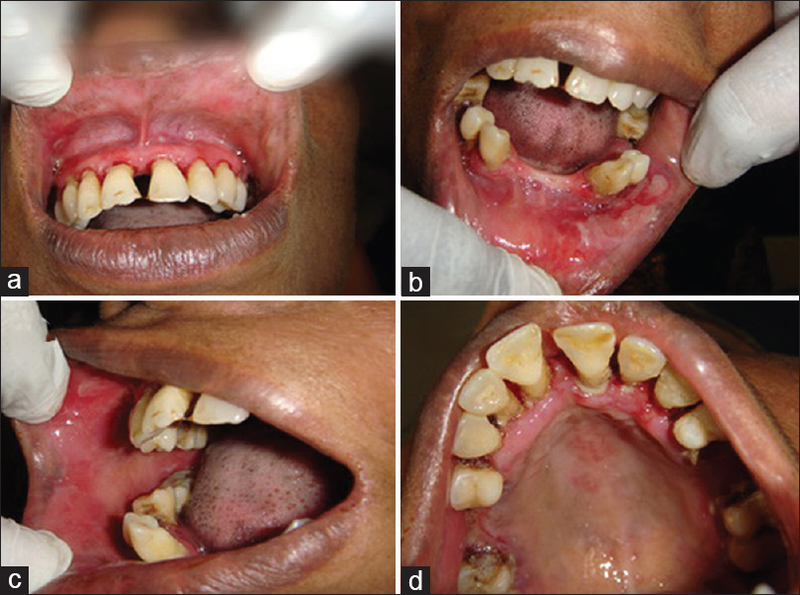 Two unique cases of oral MMP with varied clinical presentation, the diagnostic modality, treatment and follow-up are presented. Gingival overgrowths found in the oral cavity are mostly due to reactive hyperplasia and rarely depict neoplastic nature. 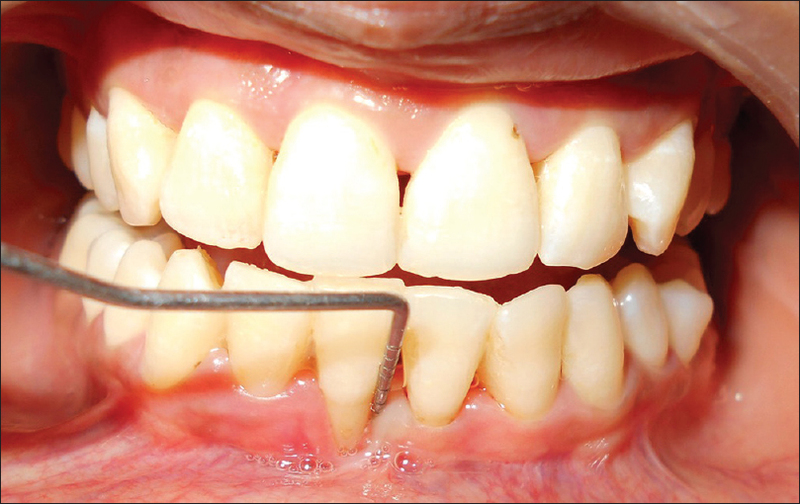 It is a challenge for the clinician to give final diagnoses of gingival overgrowth. Gingiva is a common site for various benign and malignant lesions. 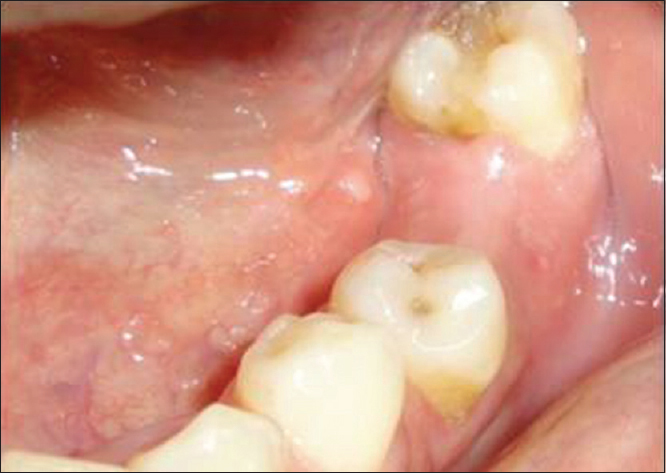 Oral cavity is an ideal niche for the manifestation of various precancerous and cancerous lesions. Fibrous growths present in the oral cavity include a varying group of reactive, precancerous, and cancerous conditions. 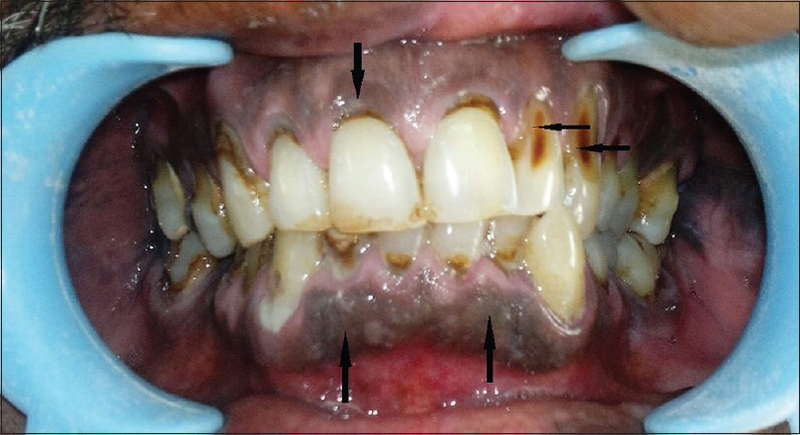 This report describes a case of a 55-year-old male who clinically presented with a localized fibromatous gingival overgrowth in relation to lower left mandibular canine-premolar region that was diagnosed as a gingival fibroma associated with leukoplakia. On histopathological examination, it was diagnosed as a case of proliferative verrucous leukoplakia. Many a times, clinicians face dilemma while diagnosing an overgrowth as it is difficult to differentiate clinically. Hence, a thorough clinical knowledge and a pathologist's opinion become mandatory to give final diagnosis to such gingival overgrowths. The lateral periodontal cyst (LPC) is a nonkeratinized, noninflammatory developmental cyst occurring adjacent or lateral to tooth root. It is a relatively uncommon lesion found in the maxillary incisors and found mostly in adults during 5th to 7th decades. In this case, 45-year-old male patient reported with occasional mild discomfort between left maxillary central and lateral incisor region since 1 year. Interproximally, a well-defined round radiolucent area with corticated borders was determined radiographically between vital tooth #21 and #22. Preliminary diagnosis of LPC was established based on clinical and radiographical findings. Following enucleation of the lesion, an anticipated residual tunnel osseous defect was observed, which was managed successfully utilizing bone graft and guided tissue regeneration-assisted technique. Cystic tissue removed was examined histologically; hematoxylin- and eosin-stained sections showed features suggestive of LPC. Complete healing of tunnel defect was achieved at 1 year follow-up. There are many etiological factors for nonplaque-induced gingival diseases, out of which physical trauma due to psychiatric reasons leading to self-infliction is less studied upon. This case report presents one such case which has been successfully treated stepwise where psychological counseling was done to restrain from habit followed by using an innovative laterally positioned periosteal pedicle graft for dehiscence coverage. Moderate-to-severe chronic periodontitis results in clinical loss of attachment, reduced width of attached gingiva (AG), periodontal pockets beyond mucogingival junction (MGJ), gingival recession, loss of alveolar bone, and decreased vestibular depth (VD). The encroachment of frenal and muscle attachments on marginal gingiva increases the rate of progression of periodontal pockets, prevents healing, and causes their recurrence after therapy. Loss of VD and AG associated with continuous progression of pocket formation and bone loss requires two-stage surgical procedures. In this article, one-stage surgical procedure is being described for the first time, to treat the periodontal pockets extending beyond the MGJ by periodontal flap surgery along with vestibular deepening with diode laser to increase the AG. One-step surgical technique is illustrated whereby pocket therapy with reconstruction of lost periodontal tissues can be done along with gingival augmentation by vestibular deepening. Dental implants have demonstrated a high degree of success in the restorations of teeth in partially or completely edentulous patients. However, when the buccolingual width of the edentulous crest is insufficient for the placement of standard sized implants, the use of two or more smaller diameter implants should be considered to avoid the need for invasive reconstruction techniques such as grafting procedures. The present case report describes the replacement of a single mandibular first molar with two narrow-diameter implants, in a 41-year- old male patient. No postoperative complications were reported in the 3-year follow-up period. The placement of two narrow-diameter implants replacing a missing mandibular molar could eliminate the mesiodistal bending, double the support capacity in the buccolingual direction, and minimize stress on the implants.